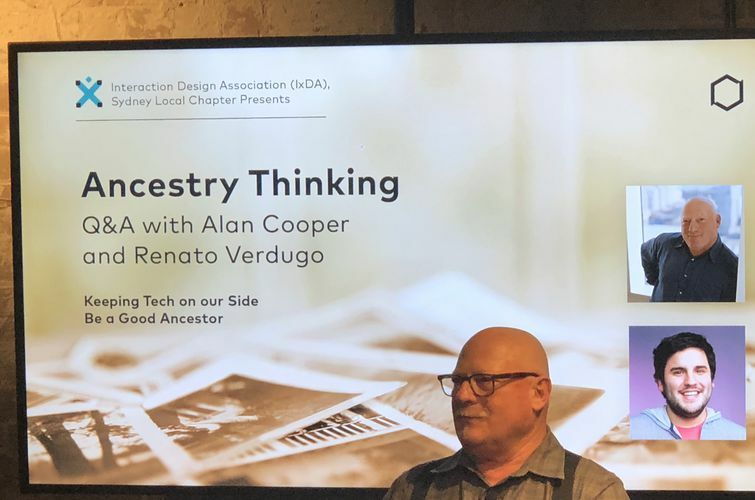 Last night Alan Cooper led a fireside chat with a crowd of technology designers hosted by the Interaction Design Association (IxDA) Sydney. IxDA is a global community focused on nurturing and developing expertise in the discipline of interaction design. Bringing together a community of people who are committed to creating meaningful relationships between people and the technology products and services that they use. Alan wants to be a good ancestor, so co-created the “Ancestry Thinking Lab.” An organization dedicated to finding and teaching practical methods for assuring that technology products behave in an ethical manner. This passion developed after a long career as an inventor and thought leader in the world of software. Alan spoke about how humans are living a life of ‘social constructs’ and referenced the book Sapiens by Yuval Harari. “We created these externalities and internalities, being economical, philosophical, social, or whatever, so we can change these social constructs too. We need to start living life with a focus not only on the short-term user experience, but the long-term affects for a multitude of stakeholders”he said. Alan used the analogy that humans are ‘building a house’, some people are living in the comfortable rooms of the home and some people are locked out. But if one group is doing bad wiring in their room and it starts a fire, this fire will destroy the whole house and potentially the surroundings too. As creators of technology Alan wants us all to think about not just the immediate user experience of our creations, but the long-term affects on humanity, now and into the future. Even Alan admitted that this question kept him awake at night. How do we consider all the potential outcomes and effects of our technology creations? How do we make ethical products and services? What does sustainable and socially responsible business look like? The answer, I believe, is to broaden everyone’s worldview. We are all a product of our environment; our parent’s genes and memes, our immediate peers and community’s culture, and we live a life with a view that our normal is everyone’s normal – and that is not the case. How could a privileged, educated white western male understand the problems of a single mother in Africa? Or vice versa. China and India seem to understand this concept. They are sending their students to study abroad, to develop not only their skills, but more importantly, their worldviews. Will western countries be able to continue to develop revolutionary new technology that includes the world’s population? Or will we be left behind in ignorance of the bigger picture of what people actually need and want? Will you develop yourself as an individual to see the opportunities right in front of you? Or will you always not know what you don’t know? I created Bookform software to stimulate new family and community dialogues, so young people can open their eyes to other people’s perspectives and other people’s normal and develop empathy. If we start these conversations early enough, everyone will grow up to realise that there are many paths to achieving social cohesion, sustainable & profitable business and, hopefully, become a good ancestor. See the ‘Write of Passage’ project.